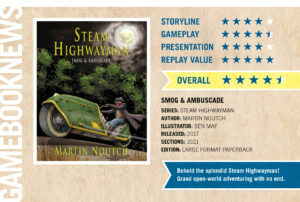 A single session might seem a short time in which to produce a complete class adventure book – but believe me – it can be done! With partly-prepared pages (which can be differentiated to account for SEN and EAL requirements in your classroom) and engaging, speedy writing, a complete book comes together in no time! 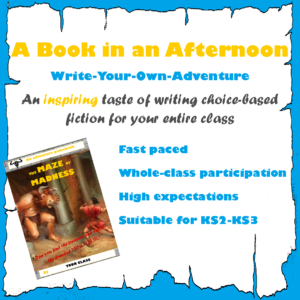 An afternoon session will include word games, short writing activities, intensive writing and editing and time to read the newly-created class book. It is designed to leave the students hankering for more and keen to explore the options presented by choice-based fiction. Your class describe adventures in a spooky Labyrinth, avoiding the Minotaur! The difficult voyage between islands of the North Atlantic might result in tragedy – or a new homeland! Can the reader survive traps and mazes and find their way to the treasure chamber? World War II – Survive the Blitz! With bombs raining down, can the adventurer find a way to survive the firestorm? Survive glaciers, crevasses, ice-storms and whiteouts to be the first to the Pole! A session will take an entire afternoon or around 2 hours with a single class, but if you wish to book for more than one class in a day, times can be adjusted to suit your timetable. All materials are provided and prices start from £180 for a single class. Interested? Click here to book a session.